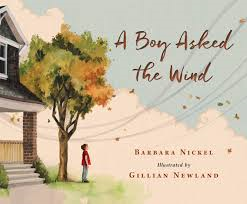 "A boy asked the wind, "Where do you live?" over his toes to scatter the leaves." 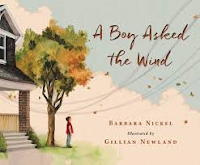 The wind responds by taking the boy on a journey around the world, showing him the five types of wind explored in Ms. Nickel's poetic text. She celebrates those winds, allowing her readers to see the benefits they bring and the effects of the climate and geography on the way they work. The lovely descriptions create word pictures to help readers understand the wind's many faces. There are so many lovely images created in stunning poetry. with many voices, one wind with many faces. My home is the world." Gillian Newland's watercolor images so beautifully embody the way the wind changes, and the varied settings for each: prairie, ocean, mountainside, desert and finally, the gentleness of the zephyr wind which returns the boy home. End notes add appreciated information about the winds, alongside a world map and a glossary. I'd braid her silky mane. That tinkled in the rain." Two books of poetic verse for the last day of National Poetry Month. It's been fun to tell you about so many wonderful books during April. I hope you will find the time to read them to your children at home, and at school. 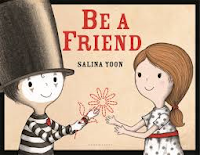 I read this book to a large group of early years children on Thursday. They were intrigued by all of the imaginary creatures, and eager to turn the pages in order to see which one came next. Sam has a wonderful imagination, and thinks that any pet would be better than her rather boring hamster. He really doesn't do much ... eat, sleep, hide in the shavings in his cage. Oh, and he drools when he's sleeping, which they thought was pretty funny. While reading a book about mythological creatures, Sam is inspired. She imagines on page after page what it might be like if her pet were a unicorn, or a hippogriff, or a sasquatch. As Sam thinks on the fun she could share with each new creature she envisions, she also considers the kind of problem she might have to deal with in their wake. Unicorns are terribly shy, hippogriffs intensely active, and a sasquatch requires a lot of grooming. Hmmm! Perhaps a small, well-behaved hamster is just exactly what she needs, all things considered. I very much enjoyed reading this rhythmic text, and watching the faces of the children as they met each new creature. They were entertained start to finish, and that is just exactly what we want books to do for our young listeners. I'm sure that Sam is not the first, or last, pet owner to bemoan the fact that their pet doesn't seem all that exciting. Given the other choices she considered, it really didn't matter all that much. The final spread has us all chuckling as we realized that perhaps Sam's hamster wasn't quite as boring as we were led to believe. Kids love a happy surprise to end their books. This book is perfect for readers who love a little magic in their creatures. Cale Atkinson does a terrific job of making them come alive, in keeping with the imagination and adventure described. The images are created in 'photoshop, fairy dust and phoenix ash' ... which explains why they are so textured, colorful and filled with emotion, I would guess. They also add a great deal of humor to this rhyming tale, causing readers to take the time to check out every detail. in pet stores, but much harder to find them in the wild. At night, they scurry out of their funnel webs ... "
For all who think that pink denotes princess parties, cupcakes, and immeasurable cuteness, this is a book that will shatter those illusions. The only thing that this collection of very odd, and not necessarily well-known, creatures have in common is their color - pink! Other than that, there is little to make you think they form a cohesive group. 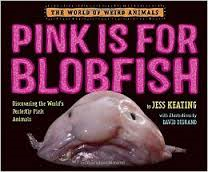 "Bizarre BLOBFISH are made of gelatinous goo, which is less dense than water. This allows them to lazily drift through the ocean like bloated pink balloons. Blobfish don't hunt for food. Instead, when something edible floats by, they simply open their mouths and gulp it down." The blobfish was recently voted the ugliest animal in the world in a poll taken by the Ugly Animal Preservation Society. Luckily, blobfish don't use mirrors, so they aren't bothered by their less-than-cute faces. As if this wasn't bad enough, another name for the blobfish is "fathead sculpin." These fish can't catch a break!" Then, a sidebar gives pertinent other facts: species name, size, diet, habitat, predators and threats. Vocabulary words that might prove difficult are shown in bold lettering, and then included in a glossary found in backmatter. The habitat of each is color-coded and plotted on a world map. Finally, the author makes some worthwhile suggestions for those wanting to learn even more. In a garden that seems to have been abandoned, we meet a playful group of small critters. Each one has their own story, set within and alongside light and airy illustrations. They are those creatures you would be most likely to see in a garden habitat, and little ones will love to hear what they do with their time. In fact, they might find the creatures trying to do what children themselves like to try. For instance, the first bug we meet is the ladybug. It turns out that she doesn't really enjoy ladylike pursuits; she would rather be barefoot, make angels in the mud, and try using a blade of grass as a whistle. What kids don't like to do those things? As we stroll, we come upon horsefly and butterfly, dragonfly, bee, roly-poly, ants both big and small, cricket, earthworm, snail, and lightning bug. Each plays a role in the garden while enjoying its beauty and the fun times to be had with the garden's many other inhabitants. Gwen Millward uses ink, pencil and watercolor to fill the verdant garden with cheery details. They provide for interested attention in the little ones who will pore over the humorous spreads. 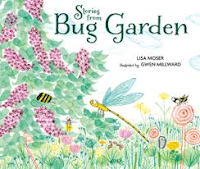 This book is a great deal of fun to read aloud, at a time in the year when we are all patiently awaiting the warmth that will allow planting a brand new bunch of seeds, and time to wait for new plants to poke out of the ground and provide a home for the host of creatures mentioned in these dialogue-rich, poetic short stories. "Shouldn't you fly around?" asked Dragonfly. "Shouldn't you sip nectar from flowers?" asked Lightning Bug. "What do you want to do then?" friend of a friend ... "
I have been looking for this book for a few years, and was happy to finally find it so that I could share it with you. I wanted it to be part of the celebration for National Poetry Month. 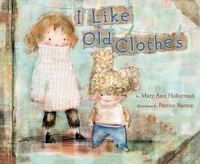 I have always admired Mary Ann Hoberman's poetic picture books. If you are a parent, you know that your children generally have more clothes than they need. If you are lucky enough to have friends whose children are older, you may often be the happy recipient of hand-me-downs. In many cases, they have rarely been worn and are in prime condition, if a little comfy. If your child is anything like the little girl who narrates this poetic text, then old clothes are exactly what's needed. Her love of clothes that come from other people sets her apart from many. She loves to wear them when she dresses up for play, and also on any given day. She finds them full of comfort because they are broken in and someone else has loved them, too. She shares her many reasons for loving old clothes with candor and care. If you are keen on recycling and reusing, it's an added bonus. Patrice Barton's softly colored and imaginatively textured images are as comfortable as the clothes so loved by our joyous narrator. The fabrics used and carefully blurred lines enhance the warm feelings associated with spending days in old favorite duds. Hooray for the sustainability inspired by hand-me-downs, and of old stories refashioned for a brand new audience. Lovely! and the things that he viewed. He was walking in the sunshine. He was swimming in the sea. Ralph Waldo was a poet. but his name's right there ... "
When the announcement is made that this year will be the last for Emerson Elementary, it is both a surprise and a shock. Yes, it is part of urban renewal for their area of the city. The school is a wreck and in need of major renovations. There are fewer children enrolled each year, and test scores are not good. Their community needs a supermarket, as they have no place to buy affordable and nutritious food for its ethnically diverse families. Solution: bulldoze the school and make way for a supermarket ... a sure sign of progress. teaching elsewhere. A time capsule is to be buried at the site. As they will be the last graduating class, Ms. Hill tasks her students with keeping a poetry journal through their fifth grade year to give voice to their thoughts and feelings. Each poem, written in varied form, introduces readers to the 18 fifth graders, their opinions about the closing and many of their experiences at school, in the community and at home. We travel right along side them as they navigate the joys and sorrows of friendship, their worries for the future, the school events that make their year memorable, and the emotion as they face their final day. They will discover voices they didn't know they had, a camaraderie that comes from sharing a final year together. They will go on to middle school, they will 'move up', they will be changed. Laura Shovan might just be a fifth grader herself, don't you think? The voices are authentic and the students are so worth knowing. They are funny, emotional, individual, honest. Yes, they struggle. They also stand together to put up a fight for their school and its future, informing themselves (with help) in how to best present their case. I like each one of them. The author provides a 'closer look' at the persona poetry that makes up this collection, inviting her audience to be sure to read poetry. She then lists the poetic forms favored by the students, including suggestions for trying to create a poem for each. By suggesting a title from the text as model to accompany her suggestions, she invites readers to take an even closer look. A glossary is also useful. "But I'm not too busy. head is in the clouds." I am soon to embark on a spring workshop tour ... sharing new books with teachers and librarians. 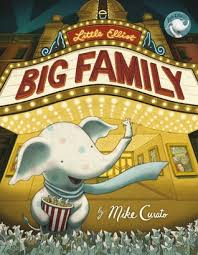 We are all happy to learn about new books that tout the importance of family reading and reading in its many forms. 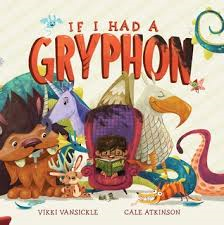 So, I was delighted to receive this new book from Owlkids that does exactly that. It shows its readers a child and his world, where books are part of the life led by those around him. The child loves the time the family spends reading. It may not always be together. 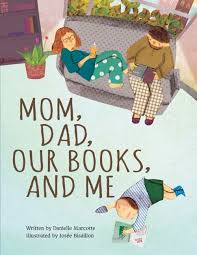 We are able to sneak a peek from above to see Mom reading a book for pleasure, Dad reading a 'how-to' e-book, and the child settled on the floor perusing a book that makes it perfect reading for him. We also learn that his pets don't read, although they certainly see him reading and evidently pleased with himself because of his newly learned skills. We also see that people around him read for a variety of purposes. Turns out that reading in not restricted to just books. Don't you just love that message? It is wonderful to see the joy and pride he feels in being part of a reading community. Josee Bisaillon uses mixed media (collage, paint and crayon) to create her detailed views of the short vignettes that make reading the center of attention for this young child and his family, neighbors and even strangers. Each deserves our careful consideration. Oh, what adventures there are when you have books! ten yards to go ... "
Nick's father is a writer and professor of linguistics ... a collector of words. Nick is tasked by him to read daily about words (they make you smarter) from his father's book, Weird and Wonderful Words. He is also well aware of the tension that exists between his parents. Even so, their separation plans take him totally by surprise. Just when he thinks that talking to a counsellor is the worst thing that could happen, he sustains an injury that requires surgery and brings an end to his soccer season. His home life assures that Nick knows about words. Still, he has always avoided reading. With his mom away working at a job she loves, Nick is forced to spend even more time with his demanding father. It is not a happy home. Can reading turn the tide and make things better? Just writing this post assures that I am going to read it again! "The power of poetry is that you can take these emotionally heavy moments in our lives, and you can distill them into these palatable, these digestible words and lines and phrases that allow us to be able to deal and cope with the world," he says. "I think it's one of the reasons why young people love reading novels in verse. It's because, on a very concrete level, it's not that many words so it's not that intimidating to me. There's so much white space." And what's that white space for? Alexander says he learned that lesson himself from a young reader. "I remember one kid telling me it's for the imagination, it's for the spiritual journey that the reader takes. And I think kids get into it. I tell teachers all the time: you want kids to get excited and get engaged with language and literature? Use poetry. It is a surefire way." "Hummingbirds are some of the smallest birds in the world. They flap their wings so quickly that they seem to float in the air as they dip their bills into flowers to drink nectar. They also eat little insects, often in flight. These tiny birds can fly at high speeds, and they can even fly upside down and backwards!" "I love the variety of birds, their colored feathers and their sense of freedom. When I moved to Canada, I discovered many birds new to me. For the first time I saw cormorants, sandpipers, gulls, jays and warblers. Herons, too!" His fascination with the work of Audubon led him to try his hand at working in collage using old magazine paper, art paper and gift wrap to capture the essence of the birds he loved to watch. We are the lucky readers who have the opportunity to share the fruits of that labor, put together in an album that invites careful observation of the images created artistically to accompany short, clear bits of information for each one. Each is labelled with its common and its Latin name. A short passage describes its prominent features, and pages often include other bits of information to add interest. Accessible to young readers, it is sure to be appreciated by those wanting to know more about the birds they are likely to see in their neighborhoods, on walks, or travelling; all the while improving their bird watching talents. The images created are absolutely lovely to study, and the endpapers are a special treat. At the front, the author provides captioned illustrations of the eggs of each of the species included; the back does the same with a variety of feathers. A short glossary, a list for further reading and an index are also useful. You can feel the rhythm of the words in that short entry, can't you? 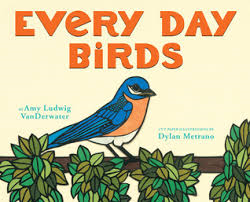 Amy Ludwig VanDerwater's newest book of poetry for children is the perfect introduction for little ones to 20 North American birds. Admittedly, kids in Manitoba may not see each and every one of them; most will be familiar if they have done any bird watching, and have shown an interest in what they are seeing. Her book opens with an invitation to join the author on a typically observant day. Each following page introduces a bird we may know and one observable (or known) characteristic. Most are birds that we can point out, or that a little one might notice on their own as they search skies and yards for avian visitors. The settings vary, as do the birds. "Each day offers new treasures, right outside of any home, classroom, or office window. In city streets, on cul-de-sacs, peppering country skies, birds are here: flashing wings, singing songs, making nests from scraps they find." She suggests listing, sketching, reading and talking to share what children learn as they become active bird watchers. Finally, she includes a short piece of text about each bird in the book, alongside a reproduced thumbnail of each. - it was still warm and its eyes were closed. for the quick beat of the bird's heart in its breast. That was how they knew it was dead." Sadly, I had to pick my first dead robin of the spring off my patio this week. They fly into the sunny windows in the east too often, generally stunning themselves for a few minutes. This one hit too hard, I guess. It makes me sad. 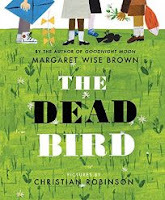 It also led me to reread this newly illustrated edition of an old favorite Margaret Wise Brown book that I shared with my children and my kindergartners a long time ago. That edition was published in 1958 (though Ms. Brown had written it 20 years earlier) and was illustrated by Remy Charlip. This thoughtful revisit is illustrated by the gifted and talented Christian Robinson. Oh, how I love his work! He places four characters in an urban setting - a green and lovely park. 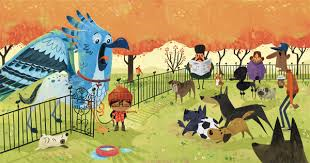 Together with their canine pal, and out to enjoy a warm and sunny day, they come upon the dead bird. One little girl bends to touch it, sharing the news that it has not been dead long ... but, it is dead. There is no heartbeat. a grave in the woods and bury it." They do what they have seen their elders do, even singing a song of remembrance to it. They cry for the loss, and then go off to play together as had been their plan before finding the bird. Each time they visit the park, they also take time to sing again and place flowers - 'until they forgot'. The setting created 'in traditional media and Photoshop' is quietly emotional, matching the tone of this honest story about death. His characters are so real that we feel we are sharing the emotions they feel, and the respect they have for the dead bird. Done in full color, he allows a close look at their expressive faces while also showing the beauty of the parkland. He constantly varies our perspective on the action, from quiet and sombre to light and playful. He is in tune with children at their best. until they saw light up ahead. It came from a cottage ... "
It's the third fractured fairy tale from this team, and it is sure to please fans of the previous two. 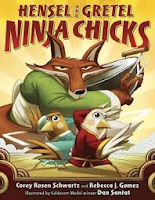 Following up on The Three Ninja Pigs and Ninja Red Riding Hood, the authors apply their rhyming skills to another martial arts story meant to amuse and engage young readers. It is a 'menacing' time for the chicks. The signs around town are evidence. 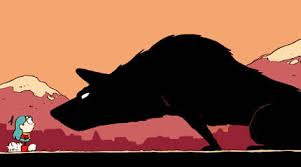 The Wolf has settled to a more sedate life and is offering yoga classes, while the 3 Pigs dojo suggests "Get empowered, not devoured". The fox that nabbed their mama is still on the loose. Dojo lessons learned, the chicks are astounded to return home to chaos in the coop and find that their father missing. They use their best tracking skills to follow all leads, dropping crumbs as they go. As you might have guessed, when they find themselves alone in the dark without further clues, they also notice that their markers are missing! Determined to forge forward, they wend their way through the forest until they are attracted to a cornbread cottage that brings light to their darkness. Tricked by the wily fox to enter his home, Hensel soon acknowledges her mistake and is captured and penned up - with her father just as her mother is chosen to be the fox's next meal! Now, it's Gretel's turn to take charge. The chimney offers a surprise entry point and a chance to save Mama. A struggle ensues. In the meantime, Hensel's preparedness allows freedom for the other members of the family, and a place of confinement for the beleaguered fox. Two fine new defenders of the weak are born! to rescue, protect and defend. till bird-napping came to an end." And so, as they say ... they all lived happily ever after! So much fun, and made even better with Dan Santat's exceptional artwork, done with Sumi brush work on rice paper and completed in Adobe Photoshop. I love the facial expressions, the varied angles and the constant motion. Kids will love them, too. Don't forget to celebrate National Poetry Month with a poem for every day! "Cassie Chadwick would not have stood out in a crowd. She had mousy brown hair, a round face with no discernible chin, and a smug, thin-lipped smile. She looked a tiny bit like Mrs. Oleson from that old TV show Little House on the Prairie. She was just a plain girl from Ontario, Canada, but she was also a criminal mastermind. Cassie Chadwick's real name was Elizabeth "Betty" Bigley." There are more than 40 stories documented of people who did not live an honest life. You will recognize some of the names, and be unfamiliar with others. Their stories are never boring and certainly will fascinate young adults, their parents and teachers. The book is divided into four sections: Tall-Tale Tellers, Great Pretenders, Cheaters and Thieves, and Aliens, Ghosts and Creature Hoaxes. You know which one will attract your attention first. I started with Great Pretenders. Surprising to me, likely because I am reading the tales rather than being involved in their results, many people were gullible enough to believe what they were being told. The writing is relaxed and great fun to read, while also being quite informative in terms of the historical settings and events. 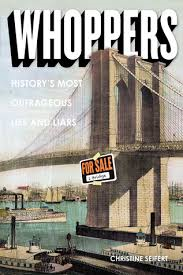 Not all whoppers were meant to dupe people. Some lies were told to ensure acceptance within the parameters and expectations of the time: a writer using a pen name, a woman wanting to fight when women were not allowed to be soldiers. Each of the stories is quickly read, first identifying the liar in bold print, giving the date, describing the lie and the reason for it. Each new section begins with a quick introduction, a short quiz to see if any of the answers to the posed questions help identify the reader as a possible member of the named group. There are sidebars to provide additional items of interests concerning the topic being shared. The author also pens a conclusion, then adds a long list for further reading and a section of references. It's a very entertaining read! We are told that Dennis is an ordinary boy. In fact, that is true: the difference between Dennis and the other children in this story is that he expresses himself in very exceptional ways. Dennis is a student of mime, as shown when his closet doors are opened. Photos of the Eiffel Tower and Marcel Marceau are prominently displayed, along with a number of black and white striped shirts, two top hats, white gloves and black dance slippers. At school he is called Mime Boy; never bullied by his classmates but isolated just the same. His white face makeup, his lack of speech and his acting 'chops' help him convey feelings, movements, and various creatures and things. He is happy. He is also lonely, often feeling that no one is really seeing him. His real place seems to be on the other side of an invisible wall. Then one day, everything changes. It begins with an imaginary ball and ends in friendship ... exactly what Dennis has been missing. Thoughtful scenes are created in black and white on brown craft paper and edged with scalloped frames. Red dotted lines help readers understand what Dennis is miming, as well as make important words more evident. The discovery of a kindred spirit puts an end to the wall, and hoists a mirror in its place. It is an amazing discovery! The joy they find in each other's friendship is noticed by the other children; it makes all the difference. Being true to yourself is a quality to be admired. Salina Yoon brilliantly depicts a boy who is worthy of that admiration. Bravo! "Perfect happiness is: gripping the bottom of a rolling chair with both hands, while Cal Price pushes me down the hall in a full-on run. We race against two of the sophomore girls from the ensemble. Cal is kind of a slow-moving person, so they totally dominate, but I don't even care. His hands grip my shoulders, and we're both laughing, and the rows of lockers are a toothpaste-blue hue." Simon is a gay teen who has been sending emails back and forth with a another gay teen in his school, known to him as Blue. Their conversations are shared with readers in chapters written from Simon's point-of-view, a perfect way to get to know the young man at the center of all that happens in this quirky, humorous, spot-on look at teenagers and the many ways they interact. Simon is a fine character. Readers are sure to enjoy his take on the world, voiced at times with great humor and at others with heartbreaking clarity. Often impetuous, Simon walks away from a school computer leaving his Gmail account open. Martin reads the series of emails between Simon and Blue and uses what he learns to blackmail Simon with exposure ... unless Simon sets him up with one of his best friends. 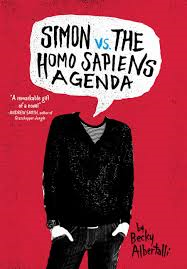 The threat forces Simon to come out to family, friends, and his classmates. Writing from her experiences in working with teens, Ms. Albertalli captures clearly the voices of each of the characters who people this very special book. They are well-developed and play an important role in helping Simon along this new path. I found myself cheering him on, while also feeling edgy about the anonymity between Simon and Blue. think I'm scared to lose you." Simon grows more and more frustrated with not knowing who Blue is, while also trying to respect his wish to stay quiet about his identity. Readers are certainly aware of how deeply each cares for the other. I was fully engaged in the mystery, always trying to guess Blue's identity. The careful clues and red herrings assure interest and maintain a quick pace. The social dynamic that propels the story is very clear and carefully written. We see Simon's friends and family supporting him in very personal ways, while also trying to navigate new waters for some of them. Their stories play a role in a narrative that is essentially Simon's to tell. While he is intent on his relationship with Blue, his friends and family are an integral part of a book that is funny, emotional, and wise. I think you should meet Simon; then, introduce him to your students. Sicily, at 18 months, loves to spend time reading Press Here over and over again. Now, we will have a brand new book to share when I visit with her next. In Let's Play, Herve Tullet proves his admiration for the intense concentration that young children bring to books which invite them to take an important role in the reading. 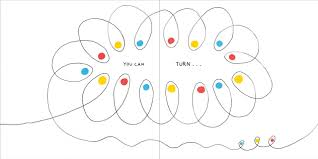 We begin with a yellow dot, that allows us to think about top, bottom, right, and middle; all without really being aware of the learning that is taking place when there is so much fun to be had. Once we have had a warm-up, off we go to follow the line and experience so much more. With our guide to help us enjoy more fun than we can imagine, we go on to change colors, spin on the Ferris Wheel, and hide in a forest filled with other primary colored dots. A dark tunnel looms ahead, and a flight of stairs! We must be very quiet ... or what? It is like a ride at the fair, exploring every avenue suggested by the text, and conquering all that might stand in a reader's way. There is flipping, and turning, and clapping, and being afraid, and making loud noises. Following directions is a huge part of the 'lesson' being imparted as we gleefully make our way from front to back, all with the certainty that we will soon be ready to begin all over again. "After Press Here, which was almost mathematical with its 15 dots going in all directions, and Mix It Up!, which was tactile, I made the dots with my bare hands. In this new experience, my goal was to go back to a kind of illustration as a way to suggest the dot’s feelings and sensations from the beginning to the end of the book. The tunnel, the dark, the fear. Going in, going out, the murmuring, on tip toe. It creates a rhythm -- and adventures that could happen to a dot, and its readers, throughout the book." Just as an aside, if you have never visited Julie's blog (and I have mentioned it in previous posts), you should make time for a long visit. It really is wonderful! "In the best tradition of science, however, this discovery raised more questions that it answered. Why do dolphins sponge instead of foraging in a more "normal" way? Why don't spongers use echolocation (dolphin sonar) to find prey?" I will never stop singing the praises of the remarkable books in the Scientists In The Field series. As I consider myself a non-scientist, I cannot tell you how much I have learned in reading them. As always happens, I set out skimming the pages to get a feel for the science and the writing, only to find myself totally immersed in the research being shared. I have never been disappointed and think that they should be a part of every middle school library, although they are definitely meant to inform each and every one of us. Only in knowing these amazing creatures can we begin to care enough to want to help ensure that they are always with us and available for study to scientists like Janet Mann. "Janet Mann stands on the dashboard of the Pomboo, bare toes gripping the steering wheel. She spots a gray fin in the distance. "Unknown dolphin," the biologist calls. After twenty-five years in Shark Bay, Western Australia, Janet recognizes hundreds of wild bottlenose dolphins by the unique nicks and cuts on their dorsal fins. This animal, however, is a stranger. Janet angles the Pomboo's bow toward the dolphin. Not quite directly, though. She never wants a dolphin to feel chased or threatened. "Does it have a sponge?" Janet asks. "Can anybody see?" Some Shark Bay dolphins sponge, and some do not. Why is that? Did they learn it from their mothers? Is that possible? It is very unusual for wild animals to use tools. 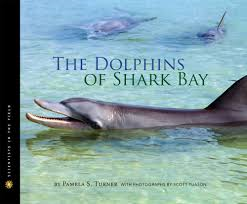 Janet Mann knows that the Shark Bay bottlenose dolphin is the only known one in the world to do so. And I know this before I get to page 5. What else is there to learn? You won't believe how much Janet Mann and her team have to share with us. Pamela Turner does an exemplary job of providing her readers with real time research as she takes us out on the Pomboo to follow those dolphins and watch them carefully as they do what dolphins do in the wild. The text is conversational as we have come to expect from this series, and accompanied by stellar, well-captioned photographs captured in the camera lens of Scott Tuason. They are as playful as their subjects and filled with visual learning that will engage hearts. Each caption provides facts about the dolphins themselves and the scientists who study them. Through text and photos, we learn that dolphin life can be very complicated. "Cheeky surfaces next to Lick as Cookie and Urchin approach. Although Janet can't see very far below the water, Cheeky's surfacing pattern (behind and just after his mother) tells Janet that Cheeky is swimming in baby position." In backmatter, readers will find a section that provides even more information about these truly amazing creatures: how echolocation works, the threats to their existence, how world scientists share their findings about them. There is also a list of internet and multimedia resources, and more books that will add to what has already been learned. There is a lovely section that includes the latest news concerning the team and the dolphins themselves, a testament to the connection the author has with her subject. 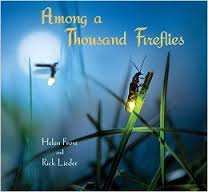 How on earth do you create such an incredibly beautiful book when the subject matter is a firefly looking for a mate? I wish I knew. All I can do from my seat here at the computer is to encourage you to find a copy of this book and see how Helen Frost and Rick Lieder have accomplished such a feat ... again! This is their third elegant collaboration, after Step Gently Out (2012) and Sweep Up the Sun (2015). Each one invites us to take ourselves and our children out into the natural world to explore its wonders and to learn more about what there is for us to truly see. It would be rare to see a firefly in Manitoba. However, the allure of these tiny creatures emitting 'light' at dusk and dawn is powerful, and I was totally engrossed in the lyrical sound of Ms. Frost's poem. The text fits absolutely perfectly with Mr. Lieder's stunning photographs that so clearly capture this tiny radiant creature. "Their flashes help them find each other when they are looking for mates. Each kind of firefly has its own pattern of flashes. 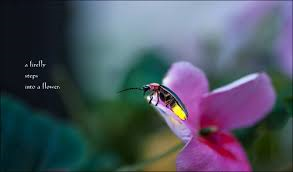 A female firefly may settle in one spot as the males flash their lights all around her. When the female sees a male flashing her kind of pattern, she flashes back, and the male comes closer." I am sure that some of you knew that. I had no idea at all, and only learned it was true when I read, and then reread, and then read the poem for a third time. This lovely book definitely deserves your attention. Taking the time to really look at the amazing images that Rick Lieder has captured inspires awe! "That afternoon, Dadima shows me how to mix turmeric, rose water, and chickpea flour into a creamy paste. We rub it on Nisha-ben before she showers. It gives her skin a silvery shimmer, a silky softness, and a fragrant smell. Later, we hang the garlands ..."
Sona doesn't know all of the traditions of her culture until her family begins to make preparations for her older sister's marriage to Anil. When her grandparents arrive from India, her grandmother asks her to be responsible for stealing the groom's shoes. "It's a tradition for the bride's sister," she tells me. "It's a way for our families to get to know each other." Learning that it is a game, and that Anil will have to make a bargain with her to get them back, Sona agrees with reservations. Her visiting cousin Vishal is only too happy to acquaint Sona with all that she does not yet know about weddings. Sona has never been to one. The preparations continue as Sona spends time trying to plot the theft of the shoes. Anil's brother Jitu will be trying to stop her. She makes a plan, realizing that she will need someone to help carry it out. She shares her idea with Vishal, who happily agrees to be her accomplice. 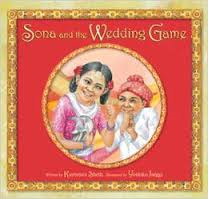 Once the plan is in place, Sona takes part in the many activities that precede the wedding. She does not let go of a small worry. As the wedding ceremony begins, Jitu takes his brother's shoes, places the bag containing them under his chair. Sona pretends to have no interest in them. At exactly the right time, the plan is put in motion. When the discovery that the shoes have been stolen is made by Anil, the bargaining begins. He wants his shoes back, and he must offer a prize for their return. Sona knows exactly what she wants! 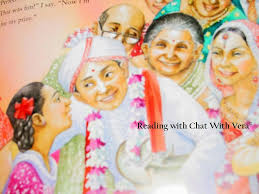 The wedding traditions are perfectly described by the author, and illustrated in pleasing watercolors created by Ms. Jaeggi who has obviously done a lot of research to bring the book to life. They are full of color, warmth and family. A very useful author's note shares some of the memories that lead her to write this story, and explains the ceremony and its many traditions. I think it's very important to share books with children that help them understand and truly appreciate that other cultures have their own special ways of celebrating important events. It develops empathy and offers shared knowledge of what makes us different as we also celebrate our similarities. You nest here with me." We all want lovely language and a peaceful pause when the sun sets and little ones settle in for another night of needed rest after a day filled with activity and learning. What better way to spend your time than with a shared storybook? and their days are done. The rhymes speak of the places these birds can be found - a swallow on a barn door, a plover at the seashore, owls in an oak tree. The rhythm of the quiet words provide just the comfort that little listeners love to hear as they drift off to dreamland. 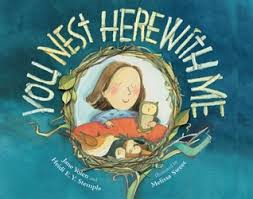 While they are basking in the warmth of a story, they are also learning about the avian wonders that Ms. Yolen and her daughter Heidi include as they write of the homes that birds build. The authors add a note in end matter to give details concerning diet, locations and the markings that help young bird watchers identify the 14 birds named. Some will be instantly recognizable; others not as familiar to a wide audience. Melissa Sweet uses watercolor, gouache and mixed media to match the comforting mood of every line, showing birds and their habitats in cool shades of blue and green. 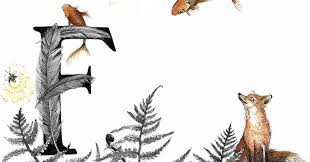 To accompany these back matter notes the illustrator adds a bird silhouette, a drawing of one feather from each, and a close up look at the eggs that might be found in their various 'homes'. '' A close look will offer up fascinating details and inspire discussion. I am forever in awe of Ms. Sweet's artwork. 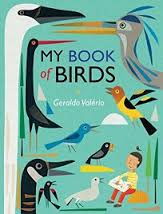 What a terrific way to get little ones looking more closely at the world and in particular, at the birds they might see when they step outside their back doors the next morning ... after a long and restful night, that is! "Aren't any of you worried about being out here with that thing running around?" "My dad says it's probably just a lost mountain spirit." "My brother says it's a demon and it only eats girls." "I understand your concerns but there's really no reason to worry. We're inside the town walls and on private Sparrow Property .. "
I have told you about the other books in this wonderful Hildafolk series. This one will only up the admiration that Luke Pearson has already garnered with his fans. The books don't need to be read as a package; each is a wonderful standalone tale of a young, brave, adventurous girl. This time, Hilda is pleased to be joining the Sparrow Scouts. While out with her mother running errands, Hilda takes note of a tiny creature sitting on the sidewalk. Since she is tasked with doing one good thing, she wonders if she might do something for the poor wee thing. Her mother has a very negative reaction to the 'house spirit', letting Hilda know that they are meant to reside invisibly inside homes. If this one is outside, the fact is that it has been banished from its home. Mom is convinced that the 'nisse' is bent on doing bad things, and misleading anyone who thinks to help them. Three stories play out here: time spent learning all the skills of a Sparrow Scout while trying to earn one more badge than her very competent and competitive mother did, the threat that is the Black Beast of Trolberg, and providing friendship to a wrongly accused and banished house spirit. Together, they provide a great deal of fun, and some worry for a young girl bent on exploration while also doing the right thing. Her concern is for her new friend, and others of his ilk, who have recently been banished from their houses under similar circumstances and are struggling to live outside their comfort zones - literally. Hilda's world is magical and quite charming. Although she seems intent on earning the badges required of her Sparrow Scouts membership, she is easily distracted from the work in response to the wonder that surrounds her. This is another great read, and sure to appeal to those who have read Hilda's previous exploits. They will be caught up in the fast pace, the discovery of the Beast's lair, and the realization that the mayhem is created out of loneliness and a need for companionship. The action is easy to follow because Luke Pearson does such a commendable job of making this long and satisfying tale so completely memorable and perfect for his intended audience. I assure you that if this is your first time meeting Hilda, you will not want it to be your last. She is a force! "Hmm. There's Franklin from Spanish class. He's so cute. Is he juggling? Wow." "The only thing that guy can't do is notice me. That's OK - I can notice him." "Uh, excuse me - Um ... hi, Ellie!" "Franklin? Talking? To me?" "Wanna buy one?" "Oh no! A candy car is not part of my lunch. There's no way I can eat that!" "Um ... er ... But, it's Franklin!" 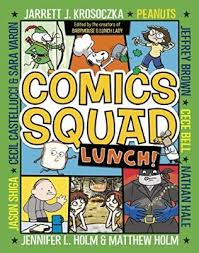 Returning to the genre of books in graphic form, I want to tell you about the second Comics Squad book. While the first one focused on Recess for its main theme, this one moves readers to the cafeteria and all things lunch related. The comic tales are told by familiar former artists, and some new to that previous team. Cece Bell is the first to share her story of a very picky female eater who is enamored of a boy named Franklin. Not wanting to refuse his request that she buy a candy bar (a definite no-no for her palate), she gives in and even tastes it at his urging. Big problem ... and then the perfect solution after a little blip in time! Up next - Charles Schulz' s matchless Snoopy, taking on the role of Head Beagle in charge of lunchroom order and efficiency. He is far too funny! Lessons from a history class on medieval times lead Babymouse to an attempt to get the peasants' lunch table back from feline usurpers, leading to a dodgeball challenge and defeat at the promise of cupcakes. So it goes ... from one entertaining tale to the next. All readers are sure to have their own favorites. The eight stories are as diverse as the artists: bullying, World War II, cave soup. The tales are mostly light, full of imagination, and often thoughtful. A few suggestions are made to encourage readers to try their hand at writing, and at drawing. A section is included to introduce the authors and their other works. Kids who love comics will not be disappointed in this second collection. It is bound to make them 'hunger' for a third! cousins. Or even just one." Once again, Mike Curato creates an appealing setting that is filled with images of old New York. He focuses our attention right from the start on family, and the preparations taking place for the many mice who are sure to be in attendance at Mouse's family reunion. The details on the title page that show the seating, the mice hoisting a banner of welcome, and the orchestrated work of many to be ready will garner attention and get young readers thinking about the upcoming event. Mouse is bursting with excitement and longing to see his many relatives. His family photo reflects the abundance of kin who will be sharing his grandmother's cheese chowder. He waves goodbye, leaving Elliott to himself in a house that is far too lonely. A walk is needed. That walk intensifies Elliott's longing for family, as he watches others take part in family outings and shared experiences everywhere he looks. There is so much that families do together. Elliott cannot imagine the joy that Mouse must be feeling right now. The longing is palpable on every spread as Elliott walks alone on sidewalks and in the park, sits alone on the subway and in a restaurant, then stands alone at the ice rink and on the pier as he stares at the vast expanse of ocean. We are so aware of the abject loneliness he is experiencing. Poor Elliott! Even an escape to the theatre is wrought with emotion as Elliott watches a family film in an empty movie house. To make it worse, it snows while he is inside and he walks out into snow and wind, only intensifying the his feelings of woe. The warmth of Mouse's friendship dulls the ache, and returns light to Elliott's world. They have missed each other, and wrap themselves in a shared hug. Mouse has an idea that is sure to end the isolation that Elliott has been feeling. He is so right! Absolutely heartwarming ... it is lovely to get to know Elliott better! I will look forward to meeting him in a future story, if there is to be one. "Miss Chandler says that life isn't worth living if you haven't a sense of poetry. But I think the most important thing those books gave me was a kind of faith. My books promised me that life wasn't just made up of workaday tasks and prosaic things. The world is bigger and more colorful and more important than that. Maybe not here at Steeple Farm, but somewhere. It has to be. It has to be." I don't blame Joan Skraggs for running away from the life she is leading with her horrible father and awful brothers, after caring for them in the wake of her beloved mother's death. She cleans, cooks, faces physical and mental abuse at almost every turn, and bears it while she can escape to her books and a chance to learn with attendance at school. The last straw comes when her scurrilous father removes her from school, refuses to pay her for her hard work, and burns her three cherished books. Joan knows she can make $6 a week as a hired girl in Baltimore. After all, it is the early nineteenth century. Bravery and anger at a high point, and with a secret stash of money left by her mother, she sets off to find work. She is 14 and alone on a park bench when she is helped by a young man who takes her to his fine home. 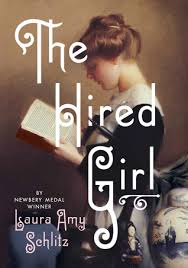 She tells the Rosenbach family that her name is Janet Lovelace, she is 18, and she will work very hard to be the hired girl they need to help Malka, their aged housekeeper. Her diary entries offer a window into Joan's world. She has grand plans for herself, and we are privy to those plans and the life she leads in the Rosenbach household trough her carefully constructed narratives. She would love to be a writer in later life. In the meantime, she will do what she has to do to make her way. She is a determined young woman, wanting to learn and eager for romance. Her voice is endlessly charming, while also being vulnerable and uncertain at times, impetuous and naive at others. In spite of her young age, she is an eager learner of the lessons that living teaches. There are some not so easily learned, and not without heartbreak. Ultimately, with the help of Malka, the Rosenbachs and her own fine character, she finds her way in life and hope for the future. Joan's story is about loyalty, honor, family, friendship, art, faith, education and love. Brilliantly told, and so memorable. 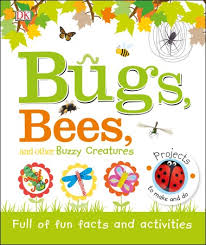 In another of the engaging and informative books of nonfiction created for little learners by DK, we take in tidbits of information about the busy bees, wriggly caterpillars, butterflies, darting dragonflies, hoppers and crickets, buzzy bees, brilliant beetles, spotted ladybugs and awesome ants that will soon be back with us. Spring is coming, I promise ... and with it come the many creatures that are soon to fascinate the inquisitive and frustrate the adults trying to answer their many questions. This little gem may be just the ticket to answer your questions so that you might answer theirs. The table of contents provides guidance to those pages that most interest you and your charges. The double page spreads offer clear photos, helpful captions and small bits of information that will not overwhelm. "Bugs come in all shapes and sizes. looking at by counting its legs." The number of legs lets children know just exactly what kind of bug they are seeing. A follow-up activity is fun and well designed. With egg cartons, scissors, paint, googly eyes and pipe cleaners, they are set to create their own collection of 'boxy bugs'. As well as the informative bits, there are activities that include creating butterflies and dragonflies, making homey cookies, and a maze game meant to encourage youngsters help the worker ant find its way to the queen. You are in for some fun when you share this book! There was a time when I collected alphabet books and had more than 100 of them at school and at home. A few remain among my favorite books to this day. One day I should write a post about them, or use them as part of a workshop with teachers and librarians. 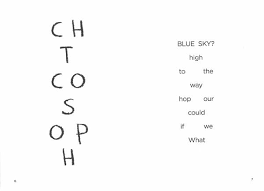 I think it takes incredible talent to write a book meant to inform readers about the 26 letters that make up our alphabet, and have it be original and as glorious as this one is. Emerging readers find them useful, and often entertaining. That is good. 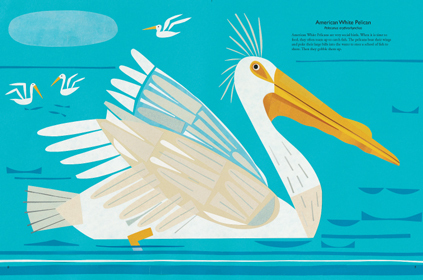 No ordinary ABC book, it is wonderfully designed and meant to make older readers think twice about the concept of letters and encourage their taking the time to calmly consider all aspects of the images. It also gives little ones a chance to stop and look carefully at each lovely spread. Here, there are only letters. There are no words! Yet, in the images she has created for a single letter on varied spreads, Kim Krans teases her readers to find more than what is obvious at first glance. The letters are prominently displayed on white backgrounds. They are outlined with black to make them stand out and generally accompanied by a collection of items that begin with said letter. Some pages are pretty straightforward, others a bit more complicated, requiring concentrated thought. They definitely build vocabulary and a sense of contemplation as a reader thinks through what is actually included in each illustration. 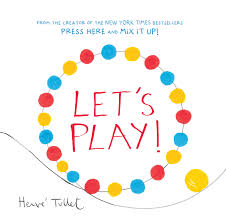 It's a great game to play between parent and child when the child is ready to think deeply and for an extended period of time. For little ones, it is a reminder of those letters that make up the words they are so busy trying to recognize as they start down the road to being literate and taking an active part in reading independently. Don't be too quick to decide you are done and ready to move on to the next letter! I missed a number on my first 'reading'. Take the time to really look, and you are sure to make some surprising discoveries. Don't give up. Do the best you can, and then check at the back to see if you missed anything. Or perhaps you can add something to the list that is already there. It's fun. It is also truly stunning. If you have a collection or are thinking of starting one, you need this book! at the Garden of the Gods. I clutched my photo, wishing ... "
While visiting with her grandmother, a little girl makes quite the discovery. 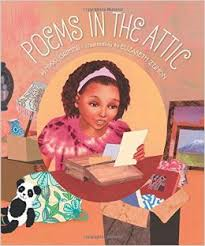 In a smooth wooden box, she finds a collection of poems that her mother wrote when she was just seven ... the same age as her daughter is now! She reads each one with interest, and with wonder at the travels that inspired them. 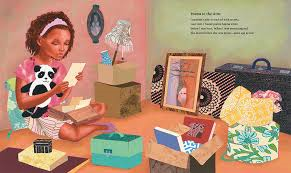 The discovered poems give the child a close look at the life led by her mother's family as they travelled from base to base. Their Air Force captain husband and father was posted to many different spots around the world. The poetry evokes the joy found in each new home, and also inspires the child to write verse of her own to partner with her mother's tanka poetry. with one of Mama's poems. my mother's eyes have seen." in the skirt of night and light." Each double page spread faces the child's experience and free verse response to the discovered tanka poems of her mother. Child and grandmother are placed in a small oval image while the facing illustration is much larger and creates the settings for the memorable stories from her family's many homes in beautifully rendered acrylic, oil and collage artwork. 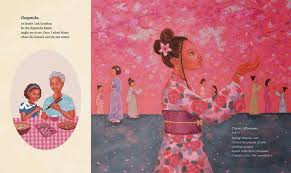 Learning her family history through her mother's poems is an amazing discovery, and helps the little girl understand that, just as she is missing her mother while staying with her grandmother, her mother must also have missed her father every time he was deployed to work in a new part of the world. took me to the Grunion Run! wiggling ashore to lay eggs." The old Japanese tanka poetic form is explained in backmatter, as is free verse. Nikki Grimes includes an author's note and a list of the Air Force bases mentioned in her lovely poetry. Enjoy a new poem every day in celebration of Poetry Month! "Fred was glad that his friends found other real friends to play with, but sometimes he wished he had a friend who would need him forever. He dreamed of a friend who liked reading, music, and drama like he did. He imagined them sitting together, reading adventure stories and looking for shapes in the clouds. This was Fred's dream." 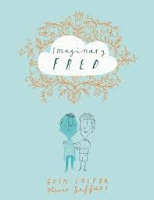 Had I had an imaginary friend, I would wish him to be just like Fred. He is experienced and knows just what is expected of him. He keeps lonely kids company when they have no one, then disappears when they find a friend and Fred is no longer needed. But, what about Fred? Is it always easy to say goodbye to the friends who no longer need him? Doesn't Fred deserve a forever friend who shares his likes, his wishes and dreams? It turns out that he does, once he meets Sam. Sam is the yin to Fred's yang. They like the same things, have incredible fun spending time together and cannot imagine days without the other alongside. Then Sam meets Sammi, a girl who shares his love of comics and drawing. Sam assures Fred that he will always need him; Fred is not convinced. Fred begins to notice his invisibility returning and knows their time together is limited. In a surprise turn, Fred learns that Sammi has her own imaginary friend whose name is Freida. The four make an inseparable, if argumentative, quartet over a long period of time. Be prepared for yet another twist as the story ends. This book is a delight, made better with Oliver Jeffers' black-ink artwork which adds humor and even more heart to a beautifully told story of friendship and longing. Fred and Frieda are created in color and dots to assure their existence beyond the 'real' world. Humorous asides are sure to elicit a chuckle or two. Carefully drawn details grab the reader's attention and encourage response. I' sure you will enjoy hearing Eoin and Oliver discussing their collaboration. time for Bear to go to sleep. want to miss out on the fun. 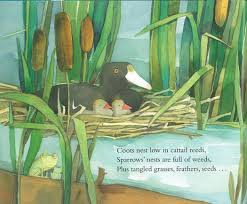 I have not yet seen Room For Bear, the book which introduced young and captivated readers to Bear and his duck family. You can bet that it is on my 'to be purchased' list now! They make a most endearing group. While this post is not perfectly timed, it's easy to make a case for what happens after a bear sleeps his winter away, as many of us would like to do some years. What did you do to get through the winter? The ducks have lots to share with Bear. Bear loves being with his new family! There are days when he even forgets that he's a bear in his quest to be a part of their every activity. A noticeable change in the temperature outside signals an innate need in Bear. Winter is on its way, and Bear needs sleep. The realization and acceptance of the fact that ducks don't hibernate as is his custom has him rethinking his natural ursine rhythms. Knowing that the ducks will do what they always do while he sleeps the winter away causes concern - he has no wish to miss the fun! Though he is equipped to spend the winter wrapped up in warm duds and tucked snugly in his bed, he decides he will not sleep. How do you think that goes? His friends cannot help but notice his lack of motivation for any activity and his endless dropping off to sleep, despite his best efforts. The ducks do their best to keep him alert and functional. There is no solution for Bear's dilemma. "Mama Duck said Bear couldn't fight who he was. winter. She promised him he wouldn't miss a thing." True to her word, he does not! Ms. Gavin's watercolor depictions of their charmed lives are filled with tender moments and gentle humor. They tell their own stories, additional and much appreciated. Don't forget to check out the endpapers, both front and back. Kids will love this friendly tale as much as they loved the first one. Now, we can look toward another companionable escapade. Or, we can hope to do so. "Birthdays are difficult days for missing people. Other days are that way, too, of course. Tuesdays, Fridays, Sunday afternoons. Holidays and school picture day and rainy days. There's at least a few lonely minutes hiding in every day, once you've said goodbye to someone you love. But birthdays are fierce. I closed my eyes and imagined my mom was there, lighting the candles on a giant pile of pancakes downstairs." Emma Pearl comes from a long line of 'extraordinary' women. She knows her mother's and her grandmother's stories very well. Before she died, Emma's mother explained the Destiny Dream that has guided their ancestral women to a fulfilling life. The Book of Days is filled with their stories and Emma is reading all of them. Emma has been waiting for her dream ... and none too patiently. In fact, she could really use an immediate life-fulfilling destiny that has to do with riches, and she knows all about the treasure that is said to be buried in the graveyard that is right next to her family's business, The Boneyard Café. Granny Blue, Emma's grandmother, is in dire need of some good luck ... as well as the cash needed to keep the business afloat. She is close to selling it to a local businessman because of her fear for her grandchildren and their future. Emma cannot imagine her town without the café in it, or the loss of her only home since her mama died. She will do what she can to save it, even if it means facing ghosts in an attempt to find the treasure said to be buried in Blackbird Hollow by the Conductor, a Civil War ghost. "Now it was my turn to stare into the glowing jukebox so Blue wouldn't see the frustration - or the determination - on my face. I knew what I was meant to do: I had to figure out what my dearly departed ancestor Lily Kate Abernathy had to do with the Conductor so I could find the treasure and save the café. But there was no way I could do all that before Warren Steele's minions showed up. And I didn't like the thought of letting them march around in my graveyard without giving them a piece of my mind." Time is running out. 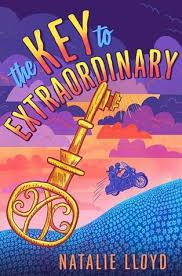 With help from her best friend Cody Belle and a former friend Earl Chance, Emma is determined to find the treasure, satisfy her destiny and save her family's home. Emma uses all that she knows about the past to bring focus to her search. Will the flowers of her confusing Destiny Dream help provide the answer she is seeking? The characters are memorable, the setting perfect, and the action keeps readers turning pages. There is mystery. There is magic. It is a marvelous story, told with heart and hope. I've created pictures with words. make you want to play with words yourself." 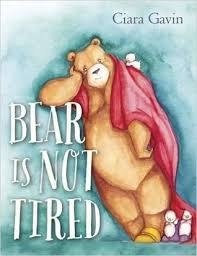 As he has in his other books, Guyku and Lemonade, Bob Raczka makes me believe that I should try to write some poetry. He certainly makes me think about words, their meanings and the ways they can be manipulated to create word pictures. So, I came to this book with much anticipation and was prepared to be awed once more by his skillful word choice. He never disappoints. 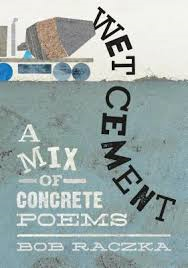 There are 21 concrete poems in this new collection, and he shapes them to help his readers clearly understand the meaning of the title for each one. He begins with a Table of Contents formed in the shape of a table, and goes on to surprise and motivate us to take up pen and paper to try some of our own 'word paintings'. The poems themselves are short; their meanings extend our thinking and cause us to look thoughtfully and deeply at language. Consider a thunderstorm as a 'cloud tantrum', or a hanger that hangs out 'in blue jeans and comfy old shirts'. Inspired and inspiring, this is a book that helps us understand why celebrating poetry for one short month each year may not be nearly long enough at all. I love it, and you will, too!